Today’s paper doll gown is for the curvy B&B paper dolls. It’s part of my Sorceress Gowns Project. My goal with the Sorceress Gowns Project was to create a series of gowns for a sorceress, as one might imagine. I started with the classic four elements- earth, air, fire and water. The element of Air inspired today’s paper doll gown. 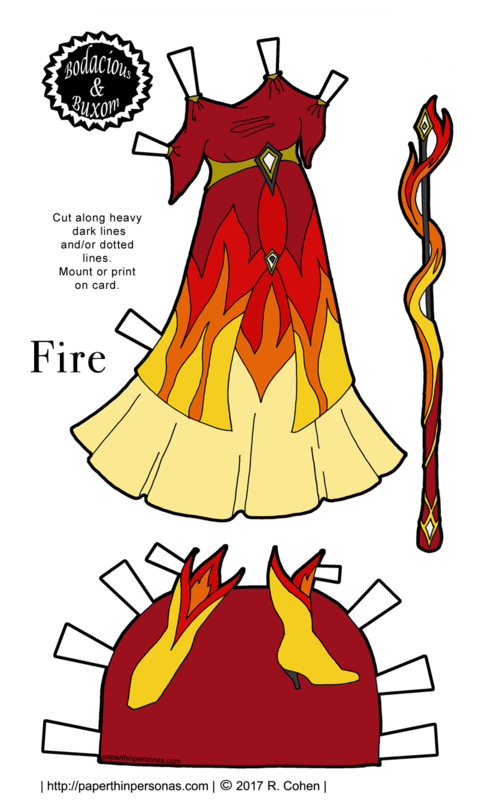 For a series of gowns based on the elements, most of the Sorceress gowns were pretty easy to design. I created Water, Fire and Earth. Earth was the hardest, but only because my sister is a geologist and I feared judgement if I didn’t get it right. Air was hard, because air is transparent. So, unless I wanted to post a blank image and declare it an Air dress, I needed to come up with some way to give Air some form. So, I went with flowing garments and soft drape. Her staff references a bird’s wing and the swirls on her dress are meant to be the breeze. 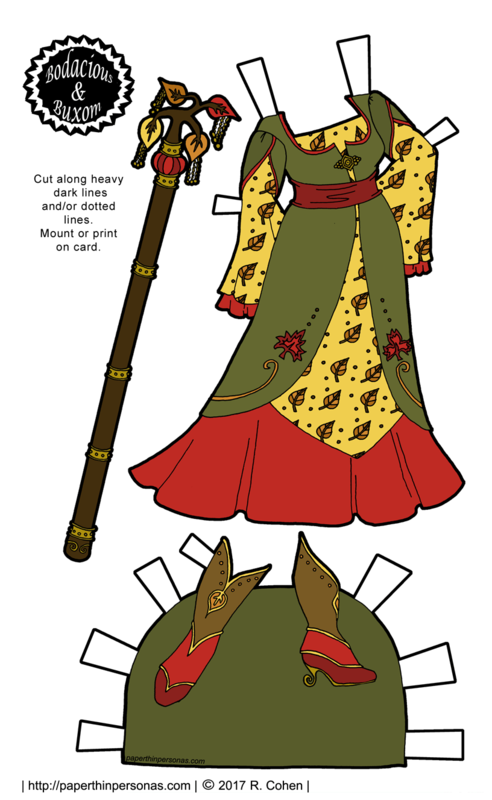 Traditional Chinese dress from the Tang Dynasty influenced this paper doll gown. I saw things like this and and this being labeled as Tang Dynasty. Now, I realize these have about as much in common with actual Tang Dynasty dress as this does with actual Italian renaissance dress. Intrigued by these outfits, I did a little more research and found this painting and this painting. Again, I have no idea how accurate most of this is. My knowledge of Chinese clothing is distinctly Qing Dynasty. And even that era, I know only the most surface of facts. Still, I love the shape and the drape of these garments, so they heavily influenced today’s paper doll gown. The chose to use colors I associate with the sky at dawn. 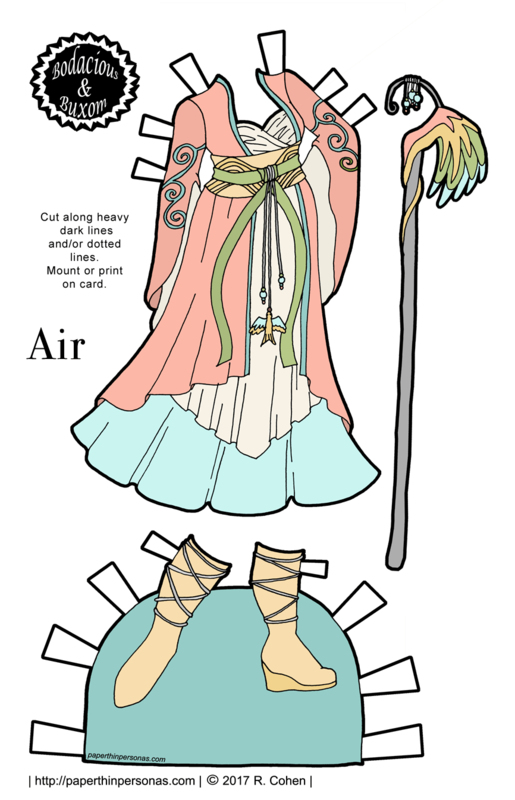 I didn’t know exactly what colors would symbolize Air, but I thought pale pastels made the most sense to me. 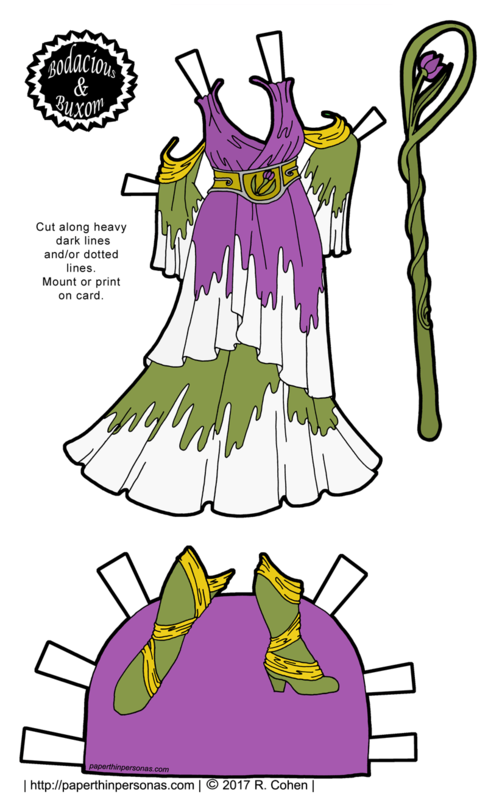 B&B’s Paper Doll Sorceress Gowns Continue! 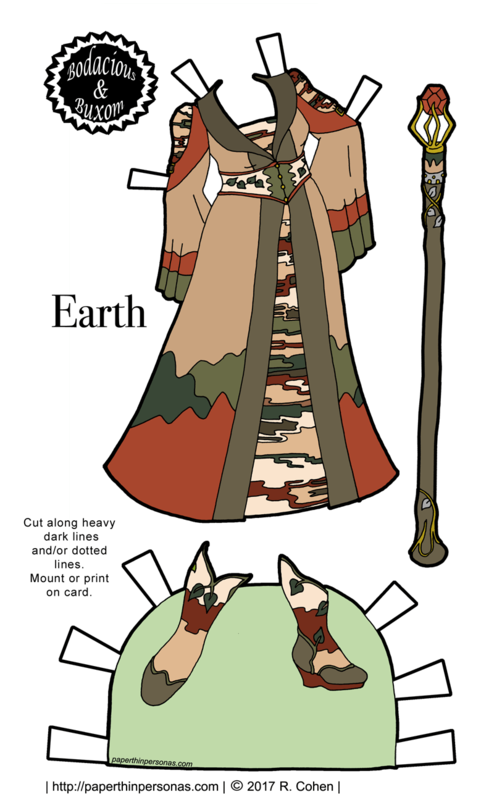 So, back in early April, I posted the first part of my Sorceress’ Gowns Project (I always come up with the most creative names.) In that intro post, I explained that I had a variety of potential long term projects, tossed them out to my Patrons and this was the winning idea. I had kinda been hoping Space Princess would win the poll, but you can’t have everything in life. And nothing is stopping me from embracing Space Princesses as a future plan. Anyhow, today’s sorceress gown is based on Water, just like my last gown was based on Fire. I wanted to pair fire and water with a similar ancient Greek influence. Mind you, this a very Hollywood idea of Ancient Greek clothing owing more to Xena: Warrior Princess than actual history. I wanted to capture the shades of water I tend to think of which are not light blues. I tend to associate water with such a dark teal that it looks nearly black which is what I remember from Southeast Alaska where I grew up. 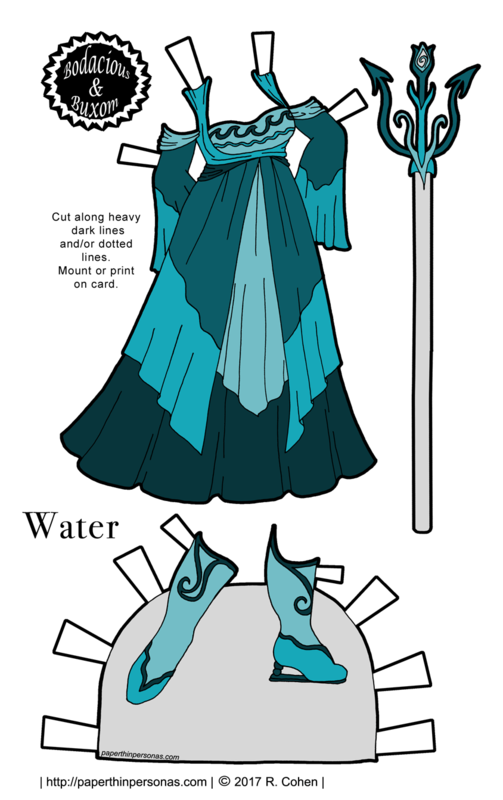 Her magical staff is based on a trident which is a nod to Poseidon, the Greek God of the Ocean. It’s probably not a very functional trident, what with the center prong being a jewel encrusted thing, but there you have it. Consider following the facebook page if you want to show the blog some love. You know what every paper doll needs? Sorceress outfits! As some of you may recall, I posted the first part of my creatively named Sorceress’ Gowns Project on April 10th. You can read that post here. My first four gowns (three of which are done) are all based on the elements- fire, water, air and earth. I have fire, water and air all finished. Earth is… well, giving me some trouble. I have faith I will finish it eventually. Each gown has two accessories- a staff to channel magical power and a pair of boots. Today’s fire gown was inspired by ancient Greek dress. I start most of my paper doll creations with a thumbnail doodle and I did the same here. 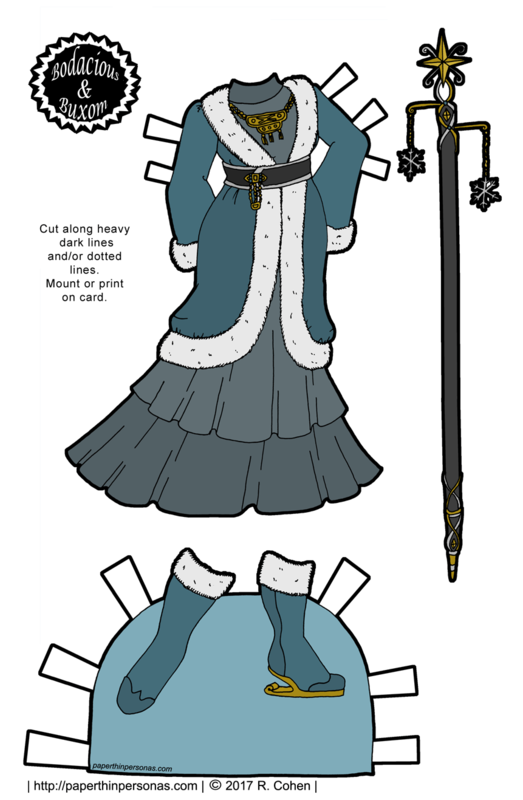 Then I expanded the doodle into a full on paper doll dress. I share my doodles mostly on Patreon, but once in a while one appears on Facebook, usually after I’ve shared with it my Patron’s first. Think about becoming a patron or following the facebook page if you want to show the blog some love. And who doesn’t want to do that?